E-government helps government to accomplish daily administrative activities and provides an easier way to communicate with external entities such as citizens and businesses through utilization of an online portal. Although adoption of e-government is potentially a route to provision of better services to citizens, it is not clear that citizens will embrace the use of such services, particularly in developing countries. This is because citizens are often concerned about the use of technology due to lack of privacy and trust for any such online transactions. As such, the success and acceptance of e-government initiatives are contingent upon citizens' willingness to adopt these services. 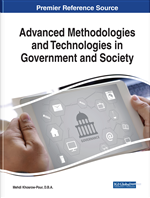 This chapter thus aims to investigate factors that can influence the future use intentions and adoption of e-government services in Bangladesh by employing the UTAUT model with the proposed constructs of privacy and trust. Findings of this study and implications for research and practice have been discussed. In recent times, e-Government services are a breakthrough of communication and transaction between the government and citizens. The communication of e-Government broadly has three categories, namely Government to Citizen (G2C), Government to Business (G2B) and Government to Government (G2G) services. Among these, it is basically the G2C services which most of the governments from developed and developing countries are focusing upon today. G2C services relates to the ability of government and citizen to communicate information to each other in an efficient and electronic manner. Its sole purpose is to provide information and assistance to citizens including links to renew a passport, download visa forms, file tax returns, etc (Schaupp, Carter & Hobbs, 2009). In fact, G2C has enabled many governments to become more responsive to the needs of its citizens, ultimately resulting in less corruption, increased transparency, greater convenience, revenue growth and cost reductions (Suki & Ramayah, 2010). e-Government services in order to promote their vision of a ‘Digital Bangladesh’. Under ‘Digital Bangladesh’ the aim is to increase momentum in efficiency and technological enhancement in government system and its performance (Islam & Khair, 2012). For this reason, the government has started pilot e-Government projects in various sectors of Bangladesh and it is being implemented under the Ministry of Planning. Also, the government is arranging substantial foreign co-operation in terms of financial assistance and technical collaboration for realization of e-Government services in the country at a national scale (Alam, 2012). e-Government projects in Bangladesh is therefore to establish a relationship between government officials and citizens by providing greater access to government information and services from all parts of the country. Moreover, increasing government accountability by making its operations more transparent can reduce the opportunities for corruption and support sustainable development goals by providing business, rural and traditionally undeserved communities with information, opportunities and communications capabilities (Hassan, 2013). Due to this growing phenomenon of e-Government services, Bangladesh even managed to attain the 148th position in world e-Government ranking compared to its 2012 ranking of the 150th position (UN, 2014). Although e-Government services is potentially a route to the provision of better services delivered to citizens at a lower cost, there is still a low level of acceptance of such services in many developing countries, particularly Bangladesh. Since the success of such services largely depends on citizens’ perceptions of the offered services, it is important to explore the factors that may influence the adoption of e-Government services by the citizens of Bangladesh.